“It’s a spider,” she said. 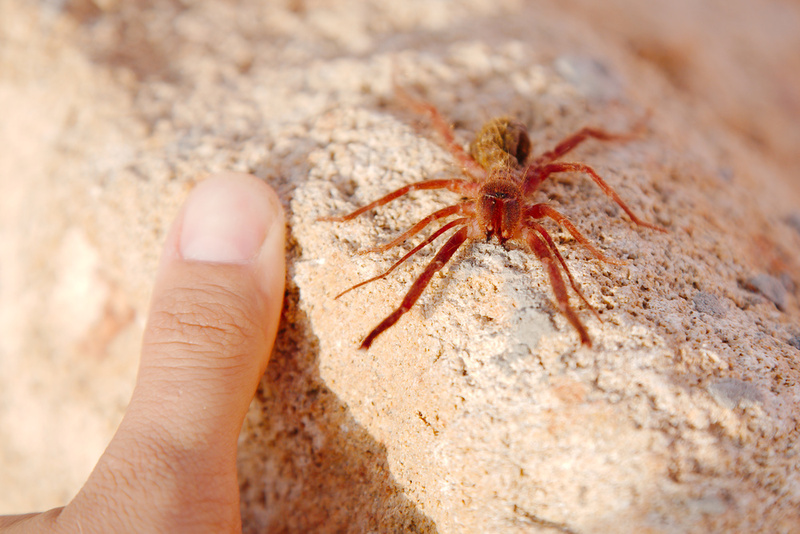 “A gigantic spider!” (It was gigantic — around 8-9cm across!) I’m lucky enough to be married to someone with a fascination for creepy-crawlies; with a smile, she deposited the dead spider in a jar for later examination and then joined me in the pool. Before heading in, my wife wanted to take a few photos of the spider’s body in the sunshine. I was gathering our things when she called out, “This isn’t a spider. It has ten legs! It’s some kind of freaky creature.” My curiosity piqued, I went over to have a look. It turned out I was mostly wrong, but not entirely. She was right — the creature we were looking at wasn’t a spider, but a solifuge. But it didn’t have ten legs. 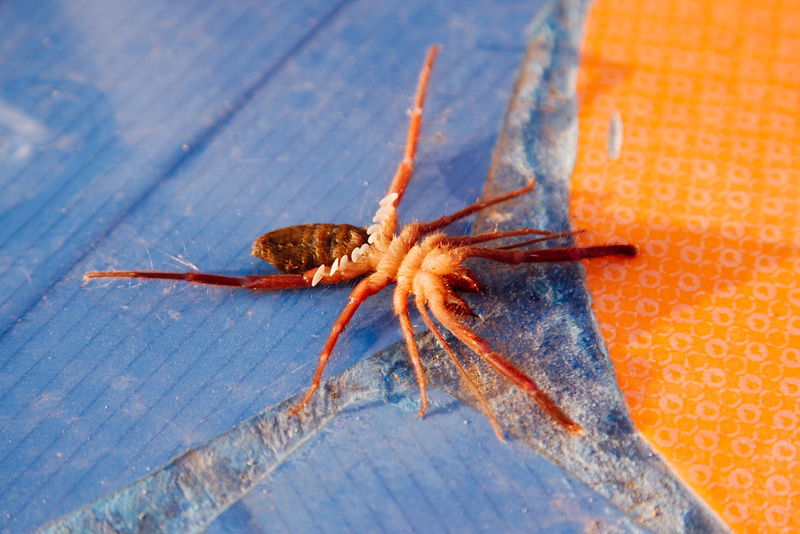 The front pair of ‘legs’ are actually pedipalps (the second pair of appendages which are modified for different uses in spiders, mites, scorpions, and other creatures — scorpions’ claws are also pedipalps) which solifuges use as sensory organs, holding them just above the ground as they run about. Of course, we didn’t know any of that at the time, nor did we manage to puzzle it out through careful study. A quick Internet search furnished all the information we could want about our remarkable discovery…but that wasn’t until we went back inside. For the moment, we were still sitting in the fading sunlight pretending to be naturalists. “What about these white things?” I asked. “They’re odd. The might be something like air sacs for breathing, or maybe they’re sensory organs of some kind. That would make sense, since they’re on the bottom of the legs.” The ‘air sacs’ notion came from the fact that we had found it on the bottom of the pool, but the fact that it was dead made that seem less likely. According to Wikipedia, these are ‘malleoli or racquet (or racket) organs’. Their function remains a mystery, though they’re thought to be “sensory organs for the detection of vibrations in the soil, perhaps to detect threats and potential prey or mates”. “It’s really hairy,” I pointed out. “Spiders usually have lots of hair on their bodies,” she told me. “Yeah, but these are really long hairs. I guess they could be for sensing, or maybe they help somehow in the water…” I hadn’t read about malleoli yet, so part of my mind was still chasing the ‘aquatic spider with a doubled pair of legs’ theory. 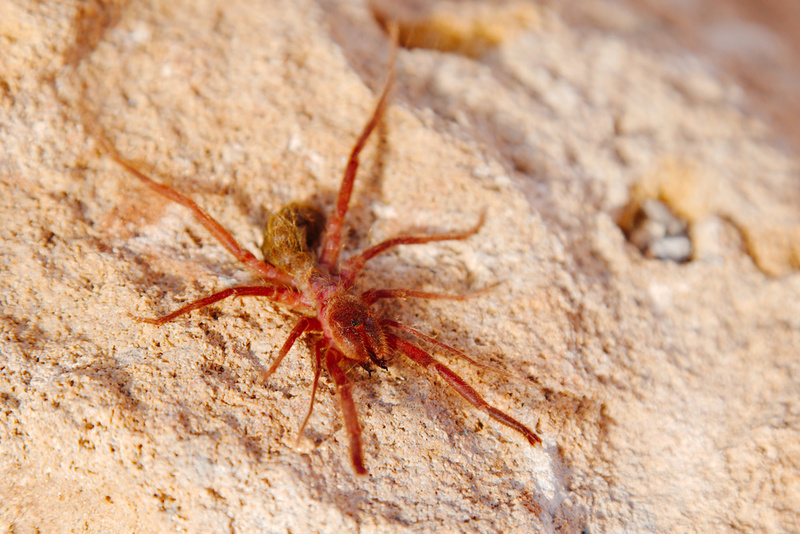 In fact, solifuges usually live in warm, arid areas, like deserts or scrubland. They had a moment of fame during the US invasion of Iraq, when their size and impressive bite captured the attention and imagination of soldiers. Despite their huge jaws, they aren’t actually dangerous to humans. They don’t have venom and usually subsist on a diet of insects, other invertebrates, and the occasional small reptile. It may not be a ten-legged giant water spider, but what a creature! I’m really glad that we had a look at it after fishing it out of the pool instead of simply chucking the body into the bushes — otherwise I would never have learned about these little beasts. I suppose many people have the idea that you have to travel off to a rainforest somewhere to spot interesting creatures and wonder about them, but this is a reminder that all you need is an open, perceptive, and inquisitive attitude. There are other creatures buzzing about you wherever you live. Even in the heart of enormous cities, a variety of birds, insects, arthropods, and small mammals make their daily living alongside the teeming crush of humanity. Far too many of us walk without looking, and so fail to notice these creatures or sense the rhythm of their lives. We may not all have the opportunity to see strange creatures in exotic lands, but we only have to look up and pay attention to discover the exotic in our everyday lives. That is a very cool bug. I think there’s a species of those here where I live (grasslands/vineyards of Sonoma County). And it is fat and huge (and slow). I usually see it crossing our lawn (yes, it is that big). I think it is a good idea to be more aware of the creatures around us and I’m VERY aware of the exotic creatures I encounter, but I choose to ignore them (for the most part). If I didn’t, I wouldn’t be able to stop shuddering. There’s this one spider (I think it’s a spider) around here that is enormous with the biggest eye-like appendages. If I didn’t ignore it every time it stumbled into our shower, they’d all be dead.